A Range Column chart type (Figure 1) shows data as vertical bars where each bar represents a value range that spans between its minimum (i.e., From property) and maximum (i.e., To property) levels. A Range Column chart type has floating columns unlike the standard Column chart type that has anchored bars to its x-axis. It is very similar to Range Bar chart, but the orientation of the bars is vertical instead of horizontal. A Range Column chart type is useful for comparing the low and high levels of value ranges (e.g., employees' working time, blood glucose levels per day, average minimum and maximum temperatures and rainfalls over time, etc.). This chart type looks like a vertical oriented simple Gantt chart where the lowest and highest values of each bar represent the portion of task completion over time. A Range Column chart differs from the Candlestick chart in the lack of weeks. 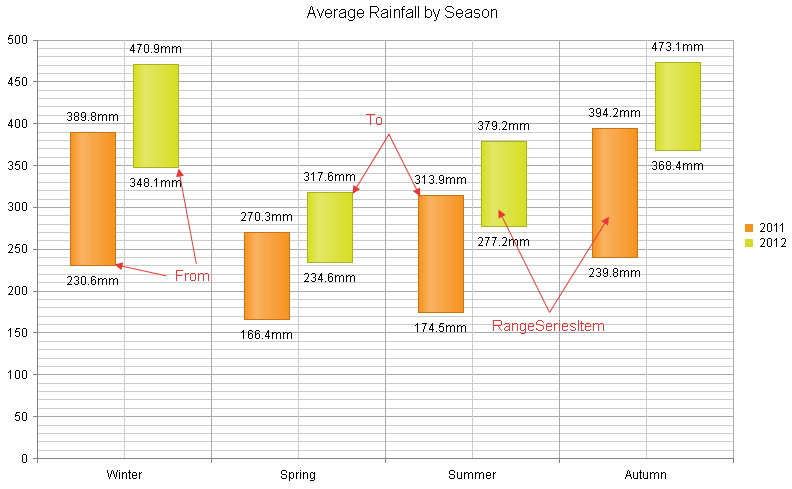 The sample in Figure 1 (which is generated by the code in Example 1) shows average rainfalls by season. For example, such a chart could easily provide yearly weather information about the extreme rainfalls distributed by seasons. Figure 1: A basic Range Column chart. Example 1 shows the markup used to create it. The following list shows the most common areas and elements of the Range Column chart that you can modify. To explore the full list of options, start from the Visual Structure of the RadHtmlChart Control’s Tag Hierarchy help article. The fill color of each series is controlled via the BackgroundColor property of the RangeColumnSeries > Appearance > FillStyle inner tag. The position of each item on the y-axis is controlled by its From and To properties of the RangeSeriesItem. Each RangeSeriesItem is placed with regard to one AxisItem on the x-axis. Each item can have a label and a tooltip that follow the common pattern defined in the DataFormatString property of the LabelsAppearance.FromLabelsAppearance / LabelsAppearance.ToLabelsAppearance and TooltipsAppearance sections of the series. The format string uses the From and To of the item. You can create more complex content via the ClientTemplate of the tooltips and labels. Directly in the axis tag you can use the tag's properties to control color, major and minor tick types and sizes, minimal and maximal values for the y-axis (plus a step size) whereas the x-axis requires a set of items to match the number of RangeSeriesItem the series have. This tag is also the place where the crossing value with the other axis can be set (the index of an item for an item axis) and whether the axis will be reversed.